Wireless Technology Basics explains the fundamentals of wireless technology and terminology. This includes how the radio frequency spectrum is divided, the basics of radio frequency transmission and modulation, antennas and radio networks. This diagram shows how an analog signal is converted to a digital signal. This diagram shows that an acoustic (sound) signal is converted to an audio electrical signal (continuously varying signal) by a microphone. This signal is sent through an audio band-pass filter that only allows frequency ranges within the desired audio band (removes unwanted noise and other non-audio frequency components). The audio signal is then sampled every 125 microseconds (8,000 times per second) and converted into 8 digital bits. The digital bits represent the amplitude of the input analog signal. 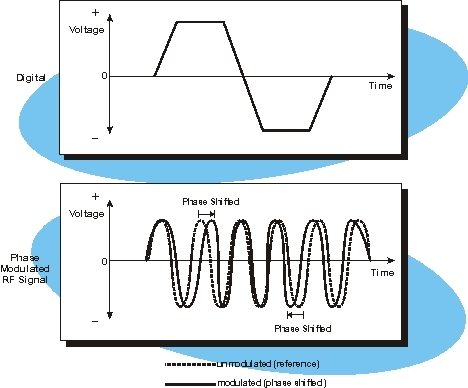 This figure shows a sample of phase modulation (PM). In this diagram, a digital signal (on top) creates a phase modulated carrier signal (on bottom). As the digital signal voltage is increased, the frequency of the radio signal changes briefly so the phase (relative timing) of the transmitted signal advances compared to the unmodulated radio carrier signal. This results in a phase-shifted signal (solid line) compared to an unmodulated reference radio signal (dashed lines). When the voltage of the digital signal is decreased, the frequency changes again so the phase of the transmitted signal retards compared to the unmodulated radio carrier signal. This figure shows how a single direct sequence spread spectrum communication channel can have several channels. In this example, there are 3 different code patterns that are used for communication channels. When a receiver uses the reference code, a direct sequence spread spectrum system can build a mask as shown in this figure for each conversation allowing only that information which falls within the mask to be transmitted or received. Mr. Lawrence Harte is the managing director of Althos, an expert information provider covering the communications industry. He has over 29 years of technology analysis, development, implementation, and business management experience. Mr. Harte has worked for leading companies including Ericsson/General Electric, Audiovox/Toshiba and Westinghouse and consulted for hundreds of other companies. Mr. Harte continually researches, analyzes, and tests new communication technologies, applications, and services. He has authored over 30 books on telecommunications technologies on topics including Wireless Mobile, Data Communications, VoIP, Broadband, Prepaid Services, and Communications Billing. Mr. Harte�s holds many degrees and certificates include an Executive MBA from Wake Forest University (1995) and a BSET from the University of the State of New York, (1990). Mr. Harte can be contacted at LHarte@Althos.com.